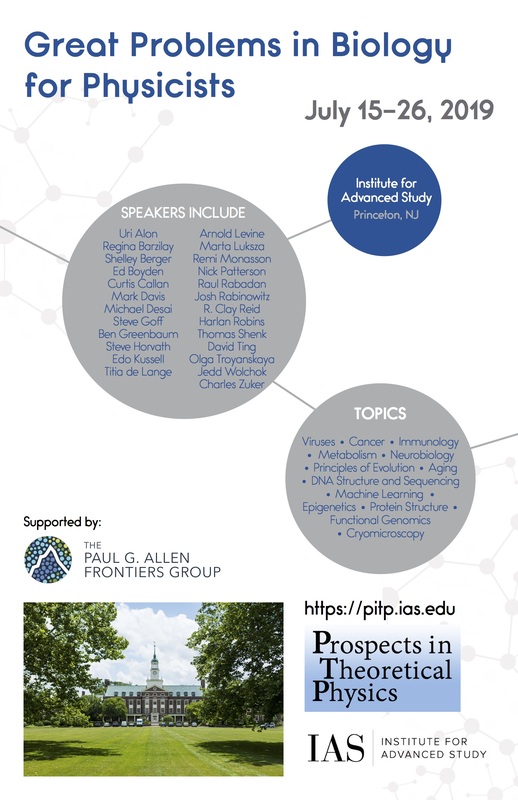 PiTP 2019 is titled 'Great Problems in Biology for Physicists,' and will cover topics ranging from virology, cancer, and immunology to machine learning and neural networks. Recent technologies have generated enormous amounts of hitherto unseen biological/genetic data. The tools of modern physics, enable novel approaches to exploration and interrogation of such data, allowing physicists to draw conclusions that will result in leaps of fundamental understanding of evolution and basic biological processes. Because physicists are now reaching out to explore problems in biology, PiTP 2019 will focus on some of the great questions in biology that are being explored. Online Application: Closed as of March 15, 2019. Suggested Pre-Reading List is now posted.